Question: I own over 20 sealed boxes of the "2005 Ocean In View" P & D nickels. So I decided to open a few up. I found a few nickels with the "ST" in "Trust" missing. Is that a common error coin? I also pulled a nickel with part of the bottom half missing. Any help would be appreciated. Thank you. Very nice website. My Answer: First off, let me say that I am not an expert in error coins, but it does sound like you have found some mint errors. 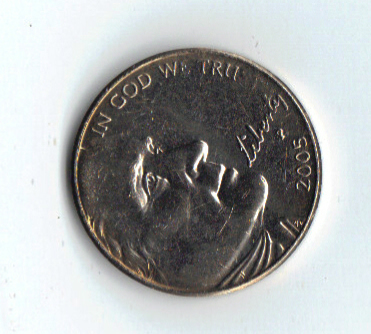 Sometimes a foreign substance such as dirt, grime or machine grease can get stuck in the die which prevents the metal from getting into all the little crevices that should be letters or numbers on a coin. This is a relatively common type of stamping error but I cannot tell you how rare it is in the 2005 "Ocean in View" Nickels. You might check with some of the coin collecting forums. A lot of collectors frequent these forums and you could get a lot of opinions all in one place. Just do a search for coin collecting forums or choose one of the links below. You will probably have to register before posting on the forums, but membership is usually free. Be sure to upload you photo for best results. I have one that the "erty" and year are missing and the entire In God We Trust is faint where Trust is almost completely missing. Lettering on the reverse is light in spots. I came across an auction which offers "2005-D Ocean In View Nickels - PLEASE NOTE it may be head-tails, heads-heads, or tails-tails"
What's the story regarding "PLEASE NOTE it may be head-tails, heads-heads, or tails-tails" ? Is this a common error specific to this coin or is the seller spinning a tail ? I found a coin where Jefferson looks like he had a nose job and to Scare's on chin .then on other side a flat shine when hit with light and right angle a comet shoots from top of tree to about the e in states . I think it might be rare . I hope it is . We just found a strange 2005 nickel. Heads is not stamped as clear, tails is smooth with faint writing around edge. What is it? I found a nickel with the start of the year 200 but it is missing the last number. It is an "Ocean in View Oh the joy Nickel". How much could it be worth?